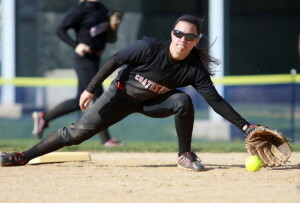 EAST MARLBOROUGH—Coatesville head coach Wendy Ford said it best, following a disappointing 8-6 loss to Unionville Monday. On Monday afternoon, much to the delight of their enthusiastic coach, Unionville showed that the message that she has been preaching all year that defense wins game, has been finally recieved, as stellar play in the field by the entire infield and more specifically by freshman Madi Ross at the “hot corner”, fueled the 8-6 Ches-Mont League win over hard hitting Coatesville. n a game that featured 26 hits and one only one strike out recorded by both teams combined, the Indians (3-2) got on the board first by rapping out six singles in the third inning posting the hosts to a 6-0 advantage for senior pitcher Colleen Beckman, who was able to keep one step ahead of the Red Raiders all day with her rise ball and screwball. “We really haven’t played our best game yet,” added Ford. “We got some big hits today, but we allowed them to keeping shipping away at us, they didn’t hit the ball hard but they were able to string singles together. 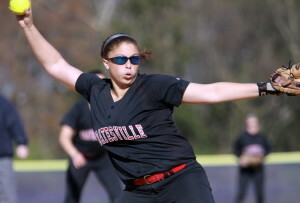 Haley (London) gave us another strong effort on the mound as she always does. We battled today, but just couldn’t get that one hit we needed. Unionville pitcher Colleen Beckman may not have been laying the Coatesville bats to waste with her stuff, but she, along with her flawless defense behind her, was able to stifle the Red Raiders when she needed to, as the Indians overcame two doubles, two triples and a home run to emerge with the win. 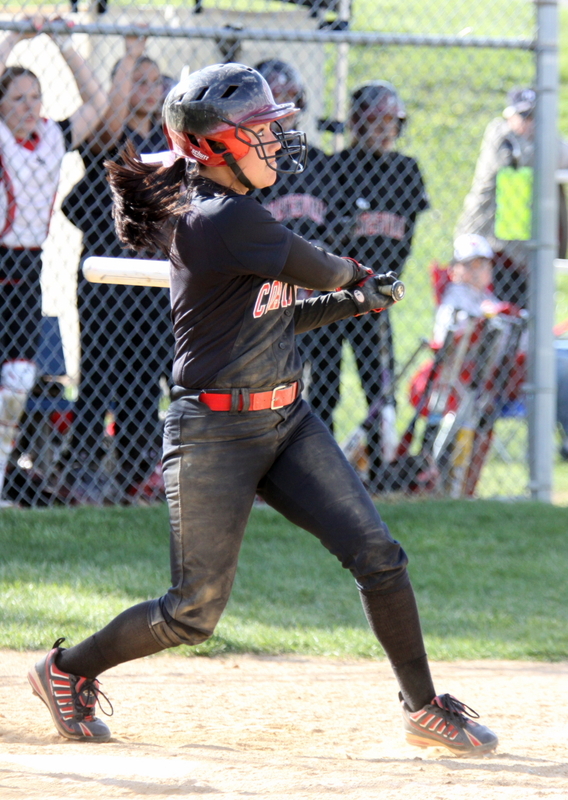 After being shut out in their first four at bats, Coatesville (2-4) knocked the goose eggs off the scoreboard in a big way as Corrine Byerly launched a bomb that cleared the wall in centerfield in a hurry to lead off the fifth. Byerly’s blast was followed up by a triple from Sara Henry (3-for-3, run scored), who would later in the inning be tagged out at the plate, and consecutive singles by Brittany Troband (3-for-4, 2 runs scored), Jackie Walsh and Mersie Waters which would post two additional runs, cutting the lead to 6-3. 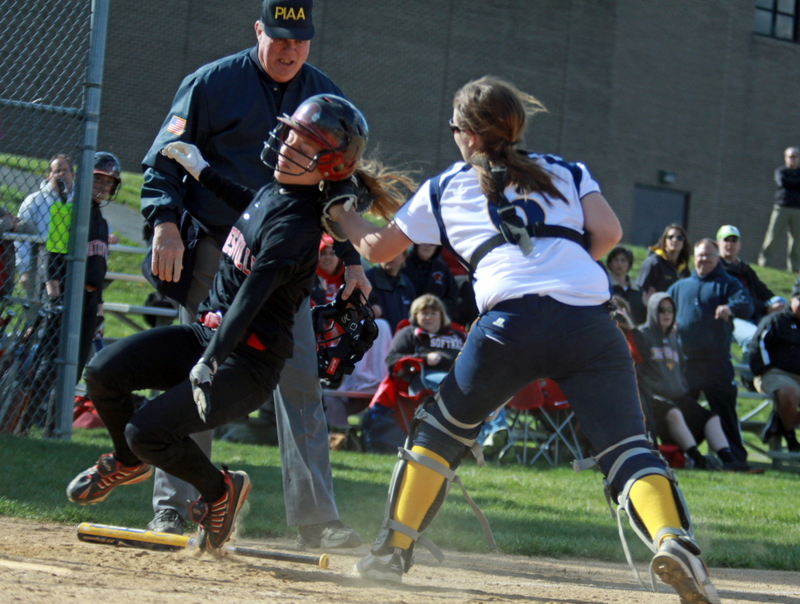 After two consecutive three up three down innings, Unionville, who did not record an extra base hit in the entire game, added two insurance runs in the home sixth with base hits by Mandy Hammond (3-for-4, 2 runs), Colleen Hoge (1-for-3, 2 runs) and Amy Large (2-for-3, run, RBI). Leading by five as the entered the seventh inning, Unionville found them selves looking at the tying run on second base following a lead off double by Henry and single by Troband, who both scored when Lara Cochran, who later scored on a single by Natalie Weaver, smoked a triple into the gap in right centerfield. 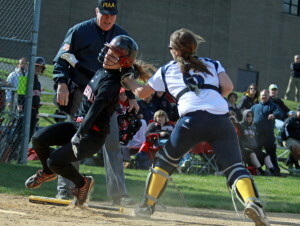 Indians senior Beckman again was again up to the task as she forced two pop outs with an inside fastball and a screw ball to preserve the win for Unionville, stranding Weaver just 120 feet away, representing the tying run. Next up for Unionville is a Ches-Mont league match up as it hosts Octorara on Wednesday at 3:45 pm, while the Red Raiders will travel to Downingtown West at 3:45pm on Wednesday.